This continuation in the unfolding Avengers saga suffers from superhero fatigue with too many costumes vying for screen time, but at least it has some crunchy fight scenes courtesy of the John Wick creators and 87Eleven founders, Chad Stahelski and David Leitch. The story looks into the consequences of the Avengers’ trail of destruction, which is so often overlooked in their many adventures. A decision is made by the US government to have them sign an accord which will put them under the lawful control of the United Nations, but Captain America sees this as restriction of their liberty. This puts him into direct conflict with the other alpha male in the group, Iron Man, and soon the gang are fighting amongst each other on political, philosophical and physical grounds. The ensuing superhero smash-up takes place at an airport. This is when the film totally loses control, with Captain America, Iron Man, Vision, Scarlet Witch, Falcon, Hawkeye, Black Widow, War Machine, Ant-Man and two newbies – Black Panther and Spiderman – exchanging blows, destroying stuff and generally causing havoc. 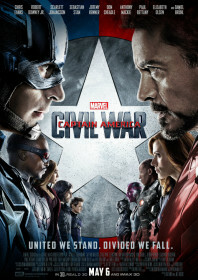 The in-fighting provides a smokescreen for a former commando – seeking revenge for the destruction of Sokovia at the end of Avengers: Age of Ultron – to stir up murderous intentions in the Captain’s old army buddy, the Winter Soldier, who is manipulated into planting a bomb in Vienna during the ratification of the accord. This gets bogged down in its own worthiness, but the occasional bantering between the group still helps to keep things light – and Tom Holland (Spiderman) and Chadwick Boseman (Black Panther) are gifted with great introductions into the pack.